450Bushmaster.net • View topic - 450b AR Style Rifle Picture Thread. 450b AR Style Rifle Picture Thread. Re: 450b AR Style Rifle Picture Thread. There was a European Boar preserve located in the Catskills of upstate New York that had some fencing issues that they never fixed. I guess this went on for years. So there is a wild pig problem that started to catch fire, not as bad as Texas or Georgia but it was becoming noticeable with many sighting of pigs across several counties. I guess some crop damage as well. Many of us were hoping for a feral pig season or perhaps an open season on feral pigs. Our boys in green at the DEC decided to make it illegal to shoot any feral pig in NY. Their reasoning was that once pigs were shot at, their colony would break up and then spread faster and create more colonies, exacerbating the problem. I think that pigs are still getting shot but no one hears much about them anymore. dantheman wrote: Many of us were hoping for a feral pig season or perhaps an open season on feral pigs. Our boys in green at the DEC decided to make it illegal to shoot any feral pig in NY. Their reasoning was that once pigs were shot at, their colony would break up and then spread faster and create more colonies, exacerbating the problem. In Michigan its shoot on sight season all year long. We dont have that many sightings in comparison to other states reporting the issues however we do have more and more reports each year. In Georgia the seasons are temperate enough to make it down right scary for the explosion. Rainy, wet lands, temperatures all year just conducive for reproduction. I am no swine expert but the breaking up of hog herds due to shooting at them make zero sense to me. Deer do not break up herding and I highly doubt Pigs do either. I agree - contacting authorities that have local impact is the best way to get a legal season - or better yet a year long season. The intelligence and common sense of your authorities will dictate the outcome. No news flash there, but good to keep in mind when you're headed to the election booth. I'm sure pigs in the Catskills are treated like coyotes are...there's a season on coyotes in NYS but most hunters shoot them on sight all year long and walk away. Coyotes kill way too many fawns in the spring. Almost there...the heavy lifting is done, the rest is cosmetics. Finished, all ready for its first range trip to sight in and chronograph my first reloads. that scopes been on my radar, what's your impressions of it? 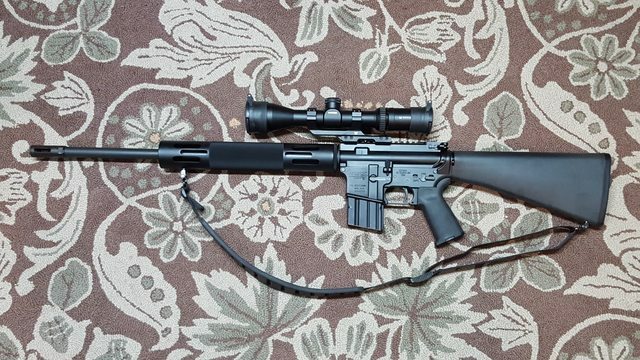 Al in Mi wrote: that scopes been on my radar, what's your impressions of it? Haven't got to shoot it yet but from looking through it and playing with it during the mounting process I have to say the I am very pleased. It is bright and clear and the eye relief is remarkable forgiving. I have a full field of view with my nose on the charging handle or with it two inches back from the charging handle. The turrets are easily re-zeroed after you sight it in which is handy. I am looking forward to shooting the whole setup. Does anyone have a picture of the factory 20 inch hand guard on a 16 inch barrel?